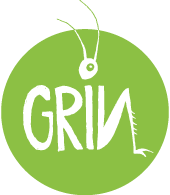 "Grin" is an Italian-Dialect word that means cricket. This insect sings for love and also to express itself, finding its place in this world. This is the music, a love demonstration of our feelings. At times it can be sad, at times cheerful and relaxing. Every culture has developed its melodies, rhythms, instruments and dances, estabilishing their love and their identity. Learning how to catch and feel all of this is the main goal of the Grin Festival. Listening to and enjoy the music of other countries is a real step into an easier integration and understanding among people, knowing that in every place in the world there is a "grin" singing and making the people dream.